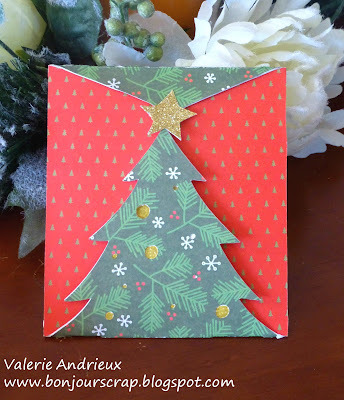 I use two different DCWV papers for the shape and its shadow, plus a small piece of golden glitter paper for the star. I cut small section to mark the corners of the gift card before adhering the red paper (Merry Memories by DCWV) inside the card. The sentiment is cut from the same cartridge at size, twice. 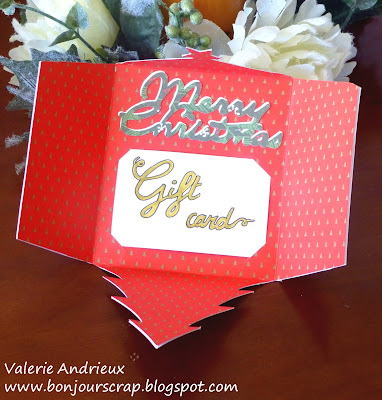 Once in green paper (Christmas Creations), another in white. And I glue them together with the white one making the shadow of the green one. What a fun design and I like how it opens up. Very creative idea! So perfect for this time of year! I don't own that cartridge but this is a terrific cut!